At the Los Angeles District of the California Academy of Nutrition and Dietetics annual transition meeting in the summer of 2016, we had a big idea. What if we could throw our own conference? 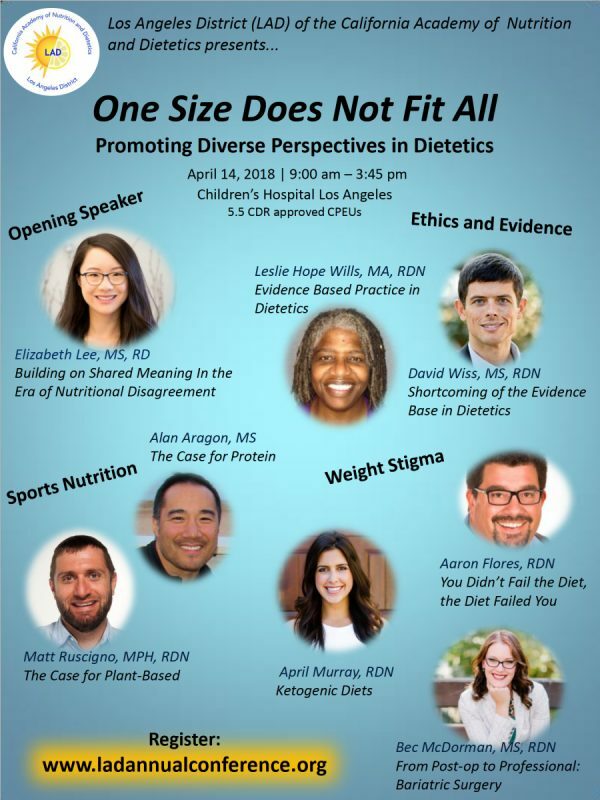 Our 2018 conference was called “One Size Does Not Fit All: Promoting Diverse Perspectives in Dietetics” and was also SOLD OUT. Our April, 6 2019 conference should be the best one yet! 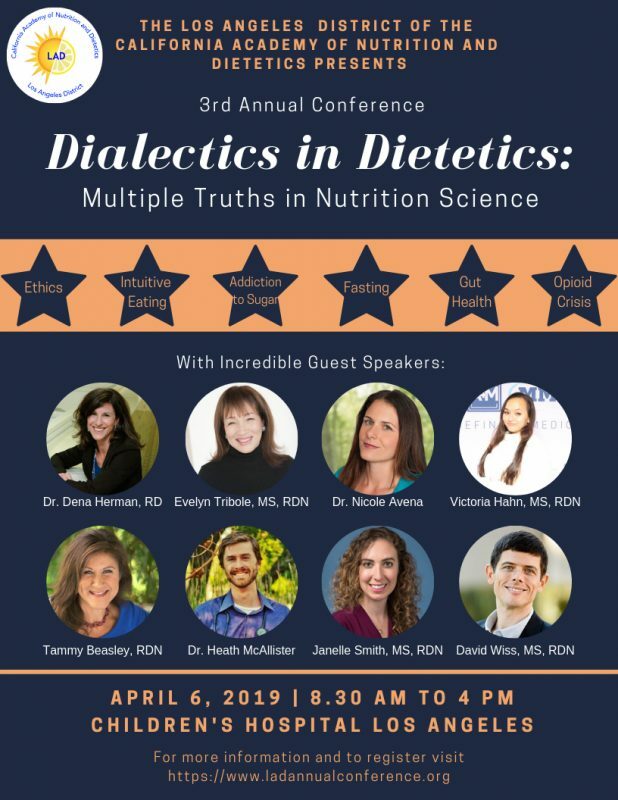 “Dialectics in Dietetics: Multiple Truths in Nutrition Science.” We are so thrilled to have such a star-studded line-up this year! 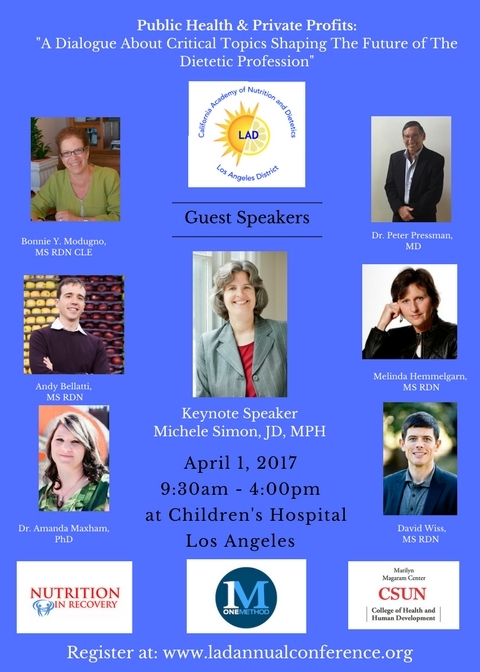 The conference is held at Children’s Hospital Los Angeles and is not to be missed! We have special pricing for students, RDNs, and LAD members! April 6 will be here before we know it! The opioid crisis has reached epidemic proportions. 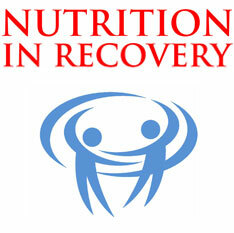 The time to include nutrition into the treatment paradigm has arrived. 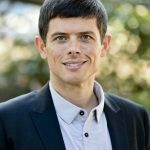 David Wiss is not afraid to take the lead, and is doing research on this topic at the University of California, Los Angeles. This presentation was given at the Food and Nutrition Conference and Expo (FNCE) on Sunday October 21, 2018 in Chicago which was an invited presentation in response to the opioid crisis. Here David Wiss describes the impact of opioids on nutritional status and gastrointestinal health, identifies common disordered and dysfunctional eating patterns common to opioid-addicted populations, and describes nutrition therapy protocols for specific substances including opioids and for poly-substance abuse. The presentation is 1:29:01 and was moderated by my dear friend and colleague Tammy Beasley, RDN. If you want to skip the video, and go straight to the slides, you can do so HERE. In summary, nutrition interventions have not yet been standardized or widely implemented as a treatment modality for substance use disorder (SUDs). Emphasis should be placed on gastrointestinal health, and reintroduction of foods high in fiber and antioxidants such as fruits, vegetables, whole grains, beans, nuts, and seeds. Adequate intake of protein and omega-3 essential fatty acids should be consumed daily. Regular meal patterns can help to stabilize blood sugar. Water should replace sweetened beverages. Caffeine and nicotine intake should be monitored. Dietary supplements can be very helpful in the recovery process, but should not supplant whole foods. Once nutrition behavior has improved, use of dietary supplements should be reevaluated. Lab tests and stool samples assessing gut function should provide valuable insights in upcoming years. In addition to expertise with the interaction between specific substances and nutritional status, RDNs working in treatment settings should specialize in gastrointestinal health, eating disorders, and should be current with food addiction research. There is a timely need for specialized nutrition expertise in SUD treatment settings, including outpatient clinics and “sober living” environments. Public health campaigns and specialized training programs targeting primary care physicians, mental health professionals, and other SUD treatment professionals are warranted.